The Amish and Mennonites in Lancaster County, PA surprisingly made household decorative wares of exuberant needlework. Plushwork is more often seen in pillows, pin cushions, small accessories, and is less common, or not often so artfully done, in full size quilts. 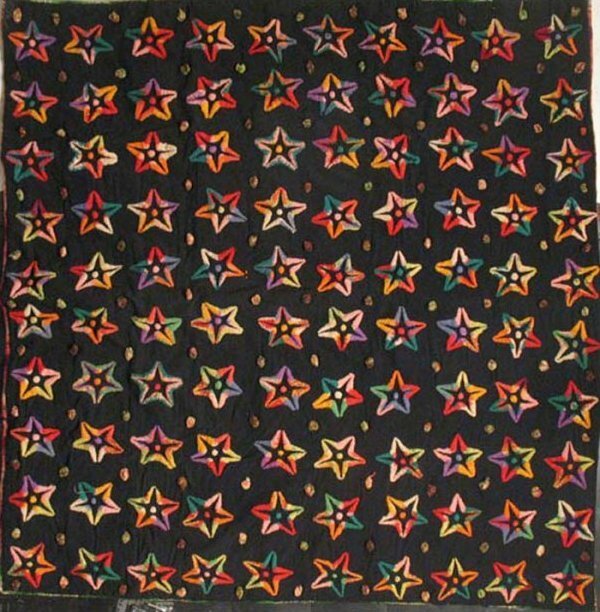 100 colorful 3-dimensional openwork five point stars are embroidered on small wool suiting squares. The technique is called 'plushwork' or 'stumpwork' because the stars are embroidered over metal templates then clipped and brushed to create a raised velvety motif. The bright rainbow yarn in this example is surprising also coming from the Amish whose lifestyle is mistakenly thought of as somber and minimalist. Plushwork quilts were featured in my museum exhibition MASTER PIECES: Haberdashery Textiles in Antique Quilts because the foundation is often dark menswear suiting material or swatches, while the embroidery is colorful Victorian-esque fancy.